Chad Dean may be one of the most-memorable people ever to appear on TLC’s My 600 lb. Life, but he’s also one of the show’s biggest success stories. Since appearing on the show in 2016 during Season 4 (with a starting weight of about 700 lbs. 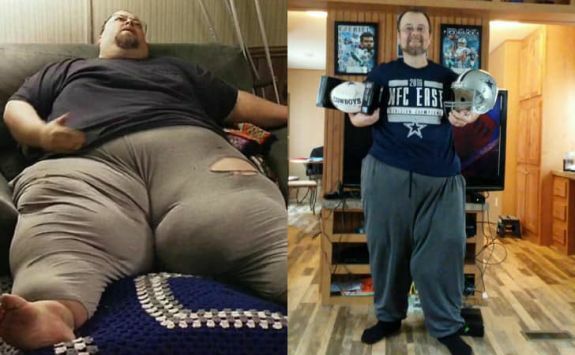 ), Chad has managed to keep off the 400 pounds he lost— and has written a new memoir about his experience. “[Chad’s] greatest hope is that others may learn from his mistakes, recognize their own decline into addiction, and pass on the knowledge to others that are still in gripping denial,” the book’s description reads. The Ashley caught up with Chad to discuss his new book, and how being on a reality show ultimately saved his life. Viewers often told Chad that he inspired them to get healthy. Is this a “tell-all” book about your experience on ‘My 600 lb.’ Life?’ Can we expect juicy details about the show? “Not in the least. I give insights to other things occurring with me and [my wife] Ayesha during that time period, but it doesn’t offer up any behind-the-scenes inner workings of the show,” Chad said. “So, if you’re looking for any dirt on the production company or TLC, then you’ve come to the wrong place! What will people learn from reading this book? Many people who go on weight-loss reality TV shows end up gaining the weight back, or being unable to lose weight. You’ve managed to keep your weight off for several years. What advice can you offer to those who are fighting a weight issue? “I’m not referring to those that have a true medical issue, but to those with a food addiction like mine: Quit allowing yourself to fall into the trap of excuses and denials of your problem,” Chad said. “You’ll see this throughout my book. I blame no one but myself for reaching that massive amount of weight. “Mine was an extreme case; however [being] even 40-50 pounds over[weight] is leading to, or already causing, internal issues,” he said. “I wrecked my spleen and liver, which are now thankfully recovered. Every day I thank the stars that I didn’t annihilate my heart. Think about the stress to your ligaments and bones. Yes, it’s hard to change your lifestyle, but it’s even harder to try to recover what you’re steadily destroying day by day. Chad’s book, I’m in Here Somewhere: Memoirs of a Food Addict, is available now in print here, or as an eBook from various sellers including iTunes, Barnes & Noble and Google Play. I have watched the show periodically and every time I see the stats on the intro that state something to the effect of only 4% manage to keep the weight off stuns me. I truly pray that he is one of the 4%! Being a alcoholic I know the stats on that are often times depressing and I feel like am I really strong enough to succeed when so many fail? He has my upmost respect and admiration! A miracle really. It is a daily battle. Sometimes minute by minute! Keep up the good work! Wow, it sounds like he’s truly changed. Really inspirational!